Marty Cooper (upper right), RCA’s vice president, addressed the Club’s 2007 Spring Gathering with the Verandah Grill’s hand-painted mural as a backdrop. Sixty members and guests attended RCA’s Spring Gathering aboard the RMS Queen Mary, a passenger ship permanently moored in Long Beach, California. 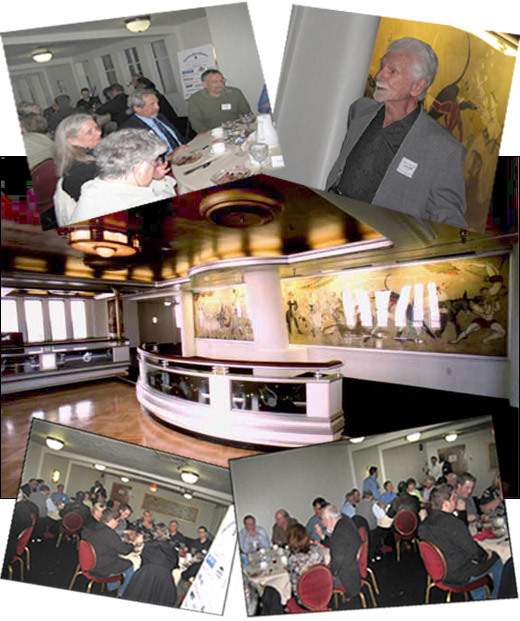 The banquet was held in cooperation with the 2007 APCO Western Regional Conference & Exposition, sponsored by the 13 chapters of the APCO Western States Region. The conference was hosted by APCO’s Southern California Chapter, the California Public-Safety Radio Association. The scheduled keynote speaker, Inspector Charles Dowd of the New York Police Department, did not attend the RCA affair apparently because of a family emergency. Martin Cooper, who delivered a keynote speech at the first West Coast banquet three years ago, was kind enough to take the scheduled speaker’s place on short notice. Marty is RCA’s vice president. He also is executive chairman of ArrayComm and non-executive chairman of GreatCall. Marty delivered remarks extemporaneously and, so far as I know, no recording or notes were made at the time. I telephoned Marty on March 6, and he summarized his speech for me. He also forwarded the text of a speech he made on February 21 at George Mason University that he said corresponded fairly well with what he said at the RCA affair, although he said that at 45 minutes in length, the university speech was much longer. “At the university, I was talking with regulators and people from think tanks and the FCC. Theyre focused on spectrum and the argument about licensed vs. unlicensed. Some think Wi-Fi will solve the problems of the world. Its wonderful. I use it all the time, but it doesnt give you city-wide access or mobility. Its a lot like a phone booth,” Marty told me. “If I had to pick one theme, it is that people should be making the decisions of what their products are. In the telecom industry, people have not had that right in the past, but they will in the future, because of the competitive environment and new technology,” he said. Here is how Marty summarized his Spring Gathering remarks. 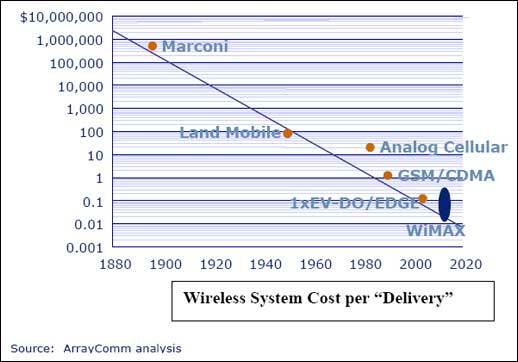 My focus was on the revolution in wireless that is going on almost behind the scenes. Most of us dont even notice it. The basis of the revolution is weve lived 100 years with one application, and that application is voice. Now there are other applications at least on the horizon and unfortunately, there are a couple of barriers. The biggest barrier is, the wireless data costs too much. The only real application that people are widely using today is short messaging service, or SMS. My view is that the applications of data will come when there is low-cost transport and a lot of applications and providers so you can have access to that transport. That is going to start happening. The catalyst will be competition,and the biggest competition on the horizon is WiMAX, and the thing that makes WiMAX attractive and a catalyst to this revolution is it will have, ultimately, low-cost data transport. What makes it low-cost is what we call MAS, multi-antenna signal processing, otherwise known as smart antennas and MIMO, which stands for multiple input, multiple output. Thats a techie thing, and we like to say MAS because it includes everything. With MAS, you use more than one antenna with signal processing behind it to optimize receiving and transmitting. Potential new applications include things like music downloading. The concept of going to a store and buying a piece of plastic and cardboard when all you want to do is listen to music doesnt make sense if you can carry a device with you and when you want to listen, you select it. Well do that in the future. The same with photography. You will be able to push a button and take a picture and push another button and it will be delivered to the person you want to view it without the intermediary of film and transfer by computer. Gaming will be a big deal. The application I think will be most profound is medical. I think the medical industry will be revolutionized by wireless. It has to do with being able to measure all kinds of functions on the body inexpensively. If you can deliver those measurements to a doctor or computer, just think: When youre sick at home, how much better that will be than going to visit him and by the time you get there, your symptoms have disappeared. Theres much work to be done, but that kind of thing will bring profound change because medical costs are skyrocketing. The bottom line is that the Internet has the ability to make us more productive, educate and entertain us, and make us safer and improve our medical facilities, but it will only happen when the cost of transport goes down and there are lots of new applications that take advantage of that. A handful of diners took advantage of a tour of the Queen Mary conducted by a security officer following the banquet. One of the first stops on the tour was the ship’s reconstructed wireless room on the Sports Deck. The original wireless equipment was installed in more than one location on the Sun Deck. The wireless room was unattended as would be expected at that late hour. The officer unlocked the room to allow entry and a close look at the equipment. After engaging in some discussion … what? … “Ooh, look at these boat anchors on a boat with an anchor.” … I made that up … the tour participants moved on to view the bridge, the officers’ quarters and the bow. And with that, my information about the Spring Gathering ends. Photos taken during the tour show examples of equipment in the wireless room. This entry was posted on Friday, March 9th, 2007 at 12:59 pm and is filed under RCA news. You can follow any responses to this entry through the RSS 2.0 feed. You can leave a response, or trackback from your own site.